The movie, Gbafolorun Nisimi, more than anything else proved that some producers are still not willing to produce excellent works. It is a familiar storyline of love that defies all odds including parental opposition and hatred to stand. Though, one cannot blame Ganiyu Quadry the producer, for adopting a familiar storyline, but it is a slap on movie watchers' face that an overused storyline could be so told in a way that lacks basic creativity. Storyline: The story is about Mistura (Bimbo Akinsanya), a Muslim and Ganiyu Quadry (Eni), a Christian who had to part ways on the insistence of Mistura's father (a man we never got to see in the movie, yet played such an important role) that Eni cannot marry his daughter because he came from a Christian home. Mistura leaned on her father's side and parted ways with Eni who met a rich woman on leaving Mistura's house and escapes a mob lynching for assisting the woman, Temilade (Moji Afolayan) to recover her bag from a thief. One thing led to another, Eni got married to the woman and subsequently became the CEO of her company. Mistura, through some drab plots miraculously came back into the life of Eni as employee of the company and he treated her badly because of the earlier treatment he received from her. Temilade died after giving birth to Eni's son and just before she died, she joined the hands of Eni and Mistura together and enjoined them to forget the past and remain friends. However, Eni's hostility continued until Mistura's inconsequential resignation led to true reconciliation and rekindling of old love affairs. Yomi (Saheed Balogun) is the close friend of Eni in the movie. Title: Right from the title of the movie, Gbafolorun Nisimi, one could see that creativity was lacking in the work of the producer. One, you'll have to think real hard to march the movie and the title after watching it. Two, the title is neither catchy enough nor creative in the modern day where a movie sells as good as its title. Casting: Though faces of Bimbo Akinsanya, Saheed Balogun and Moji Afolayan graced the movie, it is obvious that round peg was not put in a round hole. For instance, Ganiyu Quadry who wrote the story and produced it played the lead role in such a drab manner that one constantly sought for way to stay awake till the last minute. Of course, the guy has talents, but he is definitely not ripe for the kind of responsibility the movie foisted on him. One cannot blame him though. The syndrome that 'if I produce this movie, I have to play the lead role' is still prevalent among some yet-to-come-to-reality modern day producers. 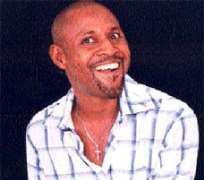 Another case of bad casting is the role of Pari Olodo, a clown who acts as the gateman of Temilade. I'm still coming to grab with what his role is supposed to be. If he is supposed to make us laugh, he succeeded in making us do the opposite. Don Richard, who played the role of a doctor was less than convincing and the thief who stole Temilade's bag was a misfit. Language: The only thing that seems to be in touch with reality is the language though Saheed trying to wax philosophical in some scenes kind of drags the play backward. Scene and dialogue: These are aspects where the producer shows he lacks what it takes at the moment to produce modern movies. There were too many unnecessary scenes and unconvincing ones at that. Eni and Yomi's scene in Port Harcourt, which incidentally is the first scene is unnecessary. Why show us an unconvincing scene in Port Harcourt when there is nothing else that has to do with the city? Eni and Yomi's dialogue on their arrival about the need to see people at home before going to see Mistura when we never get to see those people in the two-home movie is unnecessary. Even where they had to tell the Okada (bike) rider that took them home to go after performing his duty makes one wonder when it become the duty of the passenger to tell an Okada man who works by marking time to leave. The dialogue that led to the outburst of Mistura lacks conviction. The movie was full on instances of unconvincing scenes. Eni who was supposedly beaten black and blue after the saga of mistaken identity had no visible sign of beatings on him on the scene even when the mob had poured petrol on him. Too many unnecessary: There was no reason to keep hammering the angle of Mistura's father when we never get to see the man. There was also no need for the dream Eni had in the hospital. As a matter of fact, Pari Olodo had no business in the movie. Director: One wondered what Saheed Balogun's role is in the movie if he could not bring out the best in his cast. Temilade and Eni were layback and drab. As a matter of fact, one is being modest with the word, 'drab.' Perhaps, it was one of those days the director was not in the mood or there was nothing he could simply do to make a dead horse run.